The hyperspectral targeted observation systematic spectral processing was presented in detail at the 2012 CRISM Data Users’ Workshop. A brief summary is provided by [Seelos et al. 2012]. The information content of the constituent CRISM targeted hyperspectral observations has been condensed into four thematic mosaics or mosaicked browse products (FM2, MAF, HYD, ALT) that highlight mineralogically diagnostic or indicative spectral structure, two enhanced color composites (TRU, FAL) that illustrate CRISM VNIR and IR spectral variability, and two single band mosaics (VNA, IRA) that are proxies for CRISM VNIR and IR apparent reflectance. 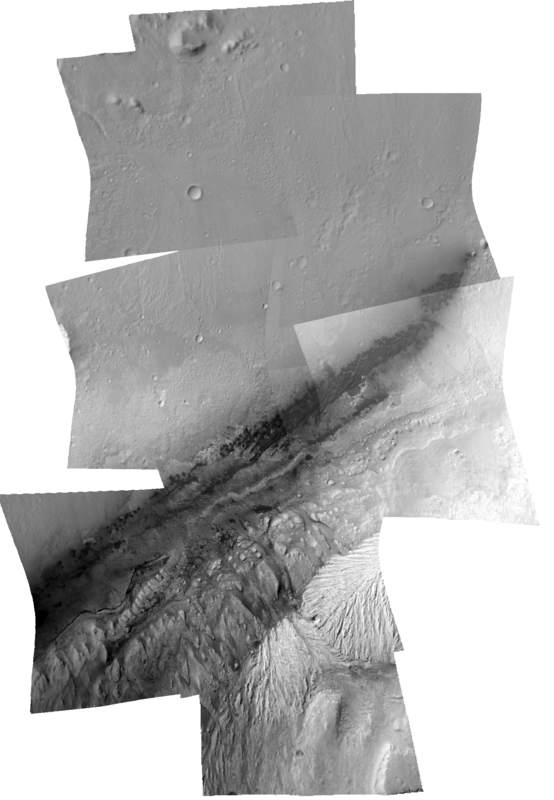 The CRISM targeted observation coverage at Gale Crater has been carefully down-selected to include a balance of quality and coverage of the landing ellipse and field site - higher spatial resolution products are emphasized, but those with elevated noise levels or atmospheric opacity are either not included at all, or are at the bottom of the mosaic stacking order. The thematic browse product composites have been iteratively adjusted to provide nearly seamless mosaicking. The color composite and individual band mosaic products have been rendered using a developmental overlap-area weighted nonlinear cumulative distribution function (CDF) optimization procedure. Minor inter-observation residuals are still present in the reflectance mosaic products. Spectral summary parameters are band math calculations that quantify diagnostic or indicative spectral structure and collectively capture the mineralogical diversity of the surface. Mathematical functions applied to reflectance values at key wavelengths allow the relative depth of particular absorption features (for example) to be quantified, and produce grayscale images indicating the presence or absence of particular phases. The summary parameters have been revised from previous multispectral formulations [Pelkey et al. 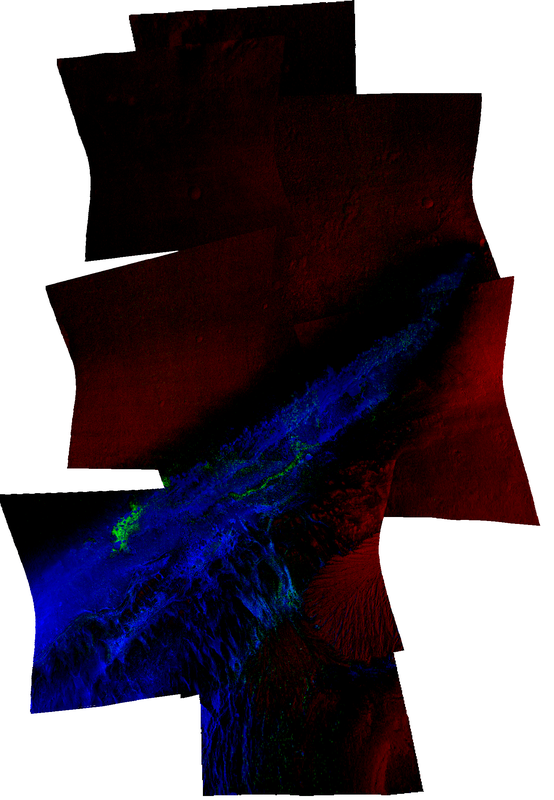 2007] to utilize the full hyperspectral sampling of CRISM targeted observations. In addition, the parameter wavelength selection has been updated to better capture the target mineral spectral signature and to avoid ambiguity. The individual summary parameter formulations used in the Gale Crater product set are listed in the table below. CRISM browse products are RGB composites of individual summary parameters (or a grayscale image of a single parameter) chosen to have thematic geological and/or spectral characteristics. When interpreting the browse products, it is important to consider the caveats in the table below for each of the constituent parameters to avoid misinterpreting weak image artifacts. Five browse products (IRA, FAL, MAF, HYD, and "ALT"- a custom browse product for Gale Crater) are constructed from the IR spectral range (1.0-3.9 µm). Three products (VNA, TRU, and FM2) are constructed from the VNIR spectral range (0.4-1.0 µm). A presentation describing the following products and an overview of the information contained on this page was given to the MSL Gale Mapping Working Group on July 24, 2012. This product shows the relative brightness of the surface at 770 nm, outside the strongest mineral absorptions. This is primarily an image that shows morphology as a reference. This product is an enhanced color composite that shows VNIR spectral variability. This product shows key features in the visible wavelength range (0.4-1.0 µm) that commonly indicate which iron-containing minerals dominate. In general, blue areas are dominated by mafics, and red/orange by ferric iron-bearing dust or analogous material. Green or yellow colors indicate the presence of crystalline ferric minerals (principally hematite). This product shows the relative brightness of the surface at 1330 nm, outside the strongest mineral and atmospheric gas absorptions. This is primarily an image that shows morphology as a reference. This product is an enhanced color composite that shows IR spectral variability. This product shows indices sensitive to iron- and magnesium-containing (usually but not necessarily primary) minerals. Occurrences can be bedrock but usually represent regolith or sand. Reds indicate olivine or Fe-containing phyllosilicate; one or both of these minerals in dust also causes dust to appear a weak red. Materials with low-Ca pyroxene appear green and high-Ca pyroxene appear blue. This product shows indicators of hydrated (water-containing) minerals, but is optimized to show different types of hydrated sulfates. Monohydrated sulfates appear green or usually yellow; polyhydrated sulfates appear magenta. Other hydrated minerals appear blue. This product is a combination of those indicators of hydrated and/or hydroxylated minerals believed to be present at Gale Crater. Together with FM2, we believe that this product depicts alteration products present and detectable by CRISM. Hydrated sulfates are green or blue-green. Blue areas either have more hydrated sulfates or one or more additional hydrated phases. Red areas have Fe/Mg clays. The constituent CRISM images were map projected to simple cylindrical at 3072 pixels per degree, with the center of projection at [longitude, latitude] = [0°, 0°]. 3072 pixels per degree was chosen because it approximates the native resolution of CRISM FRT data, and is an integer multiple of 256 pixels per degrees (the scale of many Mars global data products). At the equator 1 pixel in a map-projected targeted observation product is 19.295149 meters. Products were overlain on the CTX basemap and individually warped using the RST algorithm in ENVI to improve the spatial registration and mitigate relative map projection residuals. Note that small spatial offsets may still occur. All available CRISM targeted observations were evaluated before including them in the mosaic. Only observations having both VNIR and IR data, with the IR detector at a temperature ≤127.5K, and a 900 nm atmospheric dust opacity ≤1.0 [Wolff et al. 2009 and pers. comm.] were included. The mosaic stacking order promotes FRT observations (~19 m/pixel) over HRL observations (~38 m/pixel) and common mode observations are sorted by atmospheric opacity. For several of the observations small gain/offset corrections were made to one or more summary parameters to remove the effects of small systematic scene-to-scene calibration residuals. These are known and understood, and result primarily from the temperature of the optics and the selection of the integrating sphere observation that was used to calibrate the data to spectral radiance. CRISM browse products are intended to provide a qualitative overview of the contents of calibrated, processed image data, and are not meant for quantitative analysis. They should be interpreted with an awareness of possible false detections due to illumination or instrumental effects, or sensitivity of a parameter targeted at a particular phase to other unrelated phases. Caveats to each of the 3 bands in the composite browse products are listed in the table below. The IRA and VNA browse products provide an overview of surface brightness at 1330 nm and 770 nm. These products are rendered with a 0.1% linear stretch. Compositional information of the surface is concentrated into the FM2, MAF, HYD, and ALT browse products. A high value indicates a relatively strong spectral feature for the particular summary product in the R, G or B image plane as compared to the range present regionally around the landing site. Conversely, a low value indicates a relatively subtle feature or its absence. Stretch limits are in the table below. It is important to remember that spectral variation at Gale Crater is generally much more subtle than in some regions of the planet (e.g. Mawrth Vallis, Nili Fossae, Valles Marineris ILDs) and a regionally "strong" signature at Gale cannot be equated with a strong signature from such a region. Not all of the compositional variation present in the substrate will manifest as spectral evidence for mineralogical diversity. If a location is covered by even tens of microns of dust, it appears red in FM2 and bland in the other products. Seeing spectral properties of the substrate requires that some erosional process (wind, mass wasting) remove the dust cover. Sites with diversity in igneous mineralogy will appear interesting in MAF. Sites with minerals formed by interaction of crustal rocks with liquid water will appear interesting in HYD and ALT. In addition to those caveats, some parameters in the browse products have dependencies on solar incidence angle, surface slopes, atmospheric conditions, detector artifacts, and response to phases other than what the products were intended to highlight. For example, ALT and HYD can have bluish colors due to spectral effects of water ice hazes. Illumination geometry or atmospheric dust and ice hazes can create artifacts in MAF, PHY, HYD, and ALT. D2300 2.3-µm dropoff 1 – ((R2290/RC2290)+(R2320/RC2320)+(R2330/RC2330))/ ((R2120/RC2120)+(R2170/RC2170)+(R2210/RC2210)) where RC#### denotes the value of a point at a wavelength of #### nm along a modeled line that follows the average slope of the spectrum. 0.01-0.03 Minerals with OH bound to Fe, Mg Weakly sensitive to shaded slopes and strong brightness boundaries. 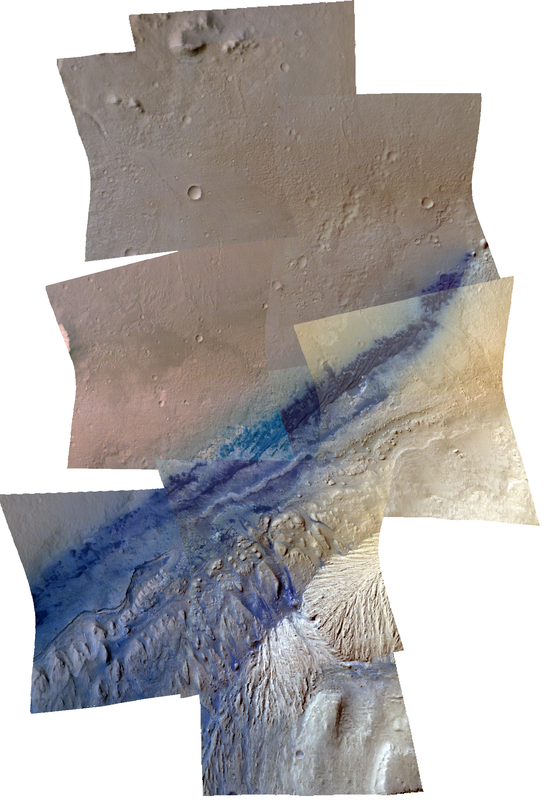 * Stretch limits are for the Gale Crater mosaics only and not necessarily applicable to other images or locations elsewhere on the planet. S. M. Pelkey, J. F. Mustard, S. Murchie, R. T. Clancy, M. Wolff, M. Smith, R. Milliken, J.-P. Bibring, A. Gendrin, F. Poulet, Y. Langevin, and B. Gondet, “CRISM multispectral summary products: Parameterizing mineral diversity on Mars from reflectance,” Journal of Geophysical Research (Planets), vol. 112, Jul. 2007. F. P. Seelos, M. F. Morgan, H. W. Taylor, S. L. Murchie, D. C. Humm, K. D. Seelos, O. S. Barnouin, C. E. Viviano, and CRISM Team, “CRISM Map Projected Targeted Reduced Data Records (MTRDRs) – High Level Analysis and Visualization Data Products,” presented at the Planetary Data: A Workshop for Users and Software Developers, 2012. F. P. Seelos, S. L. Murchie, D. C. Humm, O. S. Barnouin, F. Morgan, H. W. Taylor, C. Hash, and CRISM Team, “CRISM Data Processing and Analysis Products Update — Calibration, Correction, and Visualization,” presented at the Lunar and Planetary Institute Science Conference Abstracts, 2011, vol. 42, p. 1438. F. P. Seelos, M. Parente, T. Clark, F. Morgan, O. S. Barnouin-Jha, A. McGovern, S. L. Murchie, and H. Taylor, “CRISM Hyperspectral Data Filtering with Application to MSL Landing Site Selection,” AGU Fall Meeting Abstracts, vol. 23, p. 1234, Dec. 2009. M. J. Wolff, M. D. Smith, R. T. Clancy, R. Arvidson, M. Kahre, F. Seelos, S. Murchie, and H. Savijärvi, “Wavelength dependence of dust aerosol single scattering albedo as observed by the Compact Reconnaissance Imaging Spectrometer,” Journal of Geophysical Research (Planets), vol. 114, Jun. 2009.